Mod The Sims - CC Magic -- Custom Content Management and Game Launcher [Updated 07/15/2012 ] WORKS WITH Supernatural!!! CC Magic V2.5 design process started! Click the More Info button if you'd like to help influence the features of the next version of CC Magic. For those of you who like CC Magic, I'm in the last week of school for the year. (Finals time... ) Which means that I now have much more time for CC Magic work. I'm going to take the leap and start working on the CC Magic 2.5 update. So.. If you have any feature requests, bug reports, pet peeves, etc. Please take a couple minutes to log into my forum and see what people are proposing or to add a new feature or bug fix to the list. Now is the time to make your mark on CC Magic and get it to work the way YOU want it to. Also fixed a small issue where having a set named with a ":" in the name would crash CC Magic. Finally, CC Magic now includes a filter to correct patterns that cause the Materializing Materials issue. If you have issues with the translated version of CC Magic, you can disable the translation by deleting the appropriate folder in the CC Magic install folder. Please post any issues at my forum under the appropriate language thread. Organization : What do you do if you decide you don�t want a particular custom object anymore? How do you find it? What if you just want to disable it temporarily while testing another similar object? With thousands of CC files, it can be very difficult to track down any specific CC item. CC Magic is a way to conquer both of these issues. CC Magic allows you to organize your custom content into a hierarchy of �sets� much like file folders, thereby allowing you to find and manage your CC however you wish. 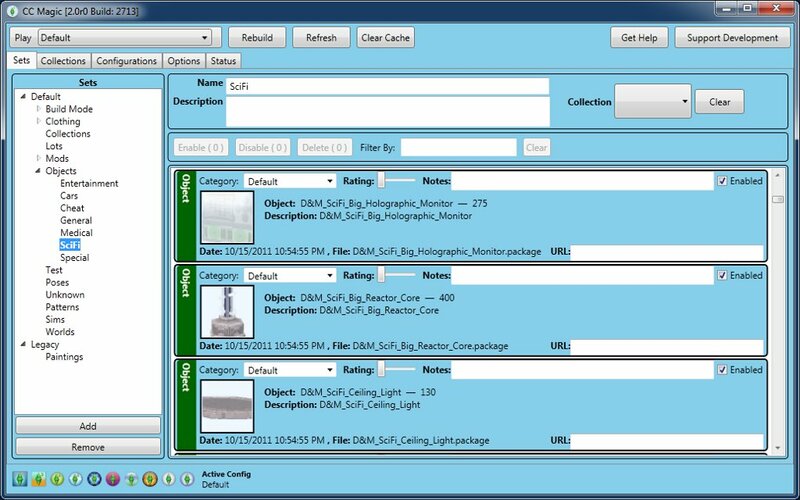 Unlike using file folders to manage your package files, CC Magic knows what those files contain and can show you information from the packages to help identify them. For example, for most items it can show you a thumbnail of the item as well as a name and description. Once you use CC Magic to organize your content files into sets, it goes one step further by eliminating the large file count lag issue. Each set you create is consolidated into a single package file (or a very few files, each file is limited to 1GB by operating system requirements), no matter how many individual packages you may have installed in the set. In addition to these core features, there are also features such as collection support for those with patch 1.26 or later (or Pets EP), and a configuration tool that allows you to keep multiple configurations of sets and activate them with a simple drop down menu. * Patterns created by the EA Create A Pattern tool should be installed with the EA Launcher. A future update to CC Magic will resolve this issue. The following links are available to provide you with help installing and using CC Magic. If you do have issues with CC Magic, I would prefer that you post a new thread in the Support Forums rather than in a comment on this download page so I can be sure and see the question and get you a prompt answer. This version corrected more invalid set names and a couple minor issues with Katy Perry Stuff and Diesel Stuff. Also include a pattern filter/fixer for Materializing Materials. This version corrected an issue with invalid set names and supports the new Badges and Achievements from Showtime. 3. Simply unzip the download and run the setup program that is included.